We are extremely excited about this special tour we have created. If you love castles, your going to love this tour. The owners of Fun For Less Tours are spending a month in Europe to explore the area. What excites them the most is they are also going to visit all of the castles and the walled cities we have planned for this group. This special designed Castle Tour will visit many of German’s top 10 castles including: #1 Neuschwanstein Castle, #2 Hohenzollern Castle, #3 Burg Eltz Castle, #4 Hohenschwangau for a picture stop, #5 Heidelberg Castle and #7 Lichtenstein Castle. Making this tour even better is our stay for two nights in the quaint medieval walled village of Rothenburg ob der Tauber. The allies stayed away from bombing this wonderful walled city, so it is still all original. When the owners were there a few years ago, their local guide pointed out a house from the 1300’s that his family has lived in continuously since the 1300’s. It has stayed in the same family, all this time, passing from one generation to the next. This will be a major highlight. When you arrive into Munich you will be met by Rob and Diane Prince. 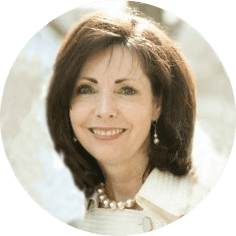 Diane Prince will be your educator during the time you are in Germany. The Oberammergau Passion Play is a MAJOR part of this package. Dr. S. Michael Wilcox will join you in Munich to help prepare you for your Passion Play experience. The German Castle part of the tour. 2 Nights 4 Star Deluxe Hotel Stuttgart. 2 Nights 3.5 Star First Class Hotel in the walled city of Rothenburg ob de Tauber. 2 Nights 4 Star Deluxe Hotel Mainz. This is a castle tour. We will be touring all of the castles listed below except the Hohenschwangau castle will only be a picture stop. The itinerary below is subject to change, as needed, at any time to accomplish everything we can in each area we visit. We will have local guides who will make sure we see the very best in the time we have. This morning we will travel into the German Alps and enjoy the beautiful scenery. We also plan to visit the Linderhof Palace before checking into our 4-star deluxe Passion Play hotel. This morning we will travel to Stuttgart. Along the way, we will visit Neuschwanstein Castle, which was the inspiration for Disney’s “Sleeping Beauty Castle”. Then we will do a picture stop of the Hohenschwangau castle. Upon arrival in Stuttgart, we will do a city tour of Stuttgart before transferring to our hotel. Today will be a great day visiting castles. We will visit Hohenzollern Castle, which is ranked the #2 castle in Germany. This majestic castle is set on top of a hill. Later we will visit Lichtenstein, which is ranked #7 castle in Germany. Return to Stuttgart to overnight. Today we will drive to Heidelberg. Heidelberg is one of Germany’s most enchanting cities with its beautiful riverside setting. Heidelberg is home to the oldest university in Germany. It also has the #5 ranked castle in Germany. The castle is the symbolic heart of the city. Then we will travel to Rothenburg ob der Tauber. This morning we will do a half day tour of the very romantic Middle Age town, Rothenburg ob der Tauber. This well-preserved medieval walled city dates back to the 13th century. With its walls, intact and the buildings inside dating back hundreds of years, this city is considered to be one of the top four “medieval jewels” in Europe. We will enjoy a stroll through the old streets and admire the noble facades of the historic buildings. The rest of the day is yours to explore on your own. Today we will drive to Mespelbrunn Castle ranked #9 castle in Germany. Then we will drive to Mainz where we will visit the Gutenberg Museum, named after Johannas Guthenberg the inventor of printing from movable metal in Western Europe. They printed the Gutenberg Bible on these presses. We will overnight near Mainz. This morning we will visit the Burg Eltz Castle ranked #3 castle in Germany. This castle is a medieval castle nestled in the hills above the Moselle River between Koblenz and Trier, Germany. 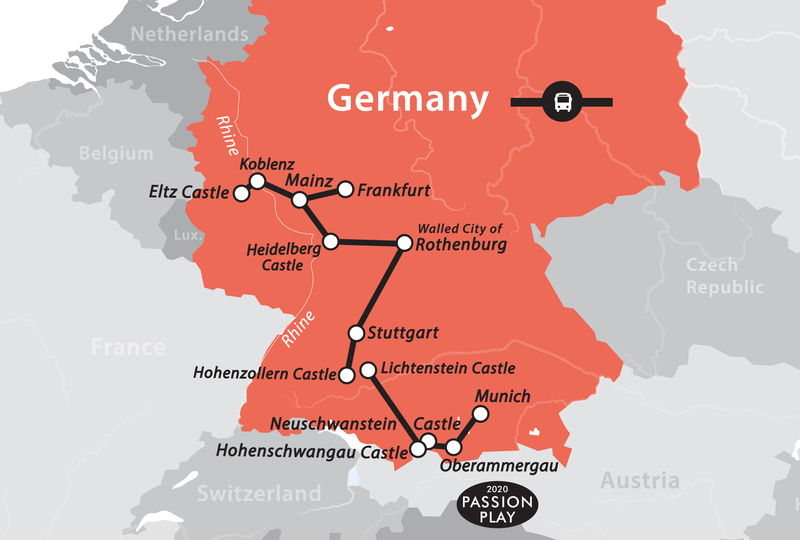 We will then drive along the beautiful Upper Middle Rhine Valley which is a Unesco World Heritage Site due to its unique combination of geological, historical, cultural and industrial reasons. We will then drive back to our hotel near Mainz. This morning we transfer to the Frankfurt airport for your return flight home.